You consider the benefits of a programme that can take you away from the day-to-day running of your organisation, allowing you to focus on the latest global business trends and complete your management education to the highest level. But do you really have the time? You think back to the last executive education course you attended. It was good enough, and you even picked up some helpful ideas in the classroom, but it focused on training and techniques without really providing you with new horizons for your business or challenging your way of thinking. You also remember wishing you had more time to interact with your peers on the programme. When it finished, you returned to the usual thorny business dilemmas that require your judgement and decision-making skills. A few days later, the training you had just received started to become a rather distant memory. For more than 20 years, Lancaster and McGill universities’ International Masters Programme for Managers (IMPM) has been reinvigorating organisations by transforming the development of their senior executives. Uniquely, for a senior executive development programme that can lead to a master’s degree, IMPM is based on a philosophy of co-creation. In fact, as a rule, half of the time spent in the classroom is designated to the senior managers themselves, allowing them to discuss what’s on their own agendas. This gives executives the opportunity to consider each of their organisations’ individual needs and challenges, while giving them a forum to discuss new ways of approaching them. This ultimately ensures they get the most out of IMPM. It is our view that organisations are communities of human beings, and not collections of human resources. Organisations work best when they are communities of committed people that work in cooperative relationships, and under conditions of trust and respect. We also feature Henry Mintzberg’s aptly named theory of ‘communityship’, which is built through senior executives engaging with their team members deeply, as opposed to having a heroic leadership style that cures all ailments. Ultimately, we believe we need development programmes that commit to developing today’s senior executives. 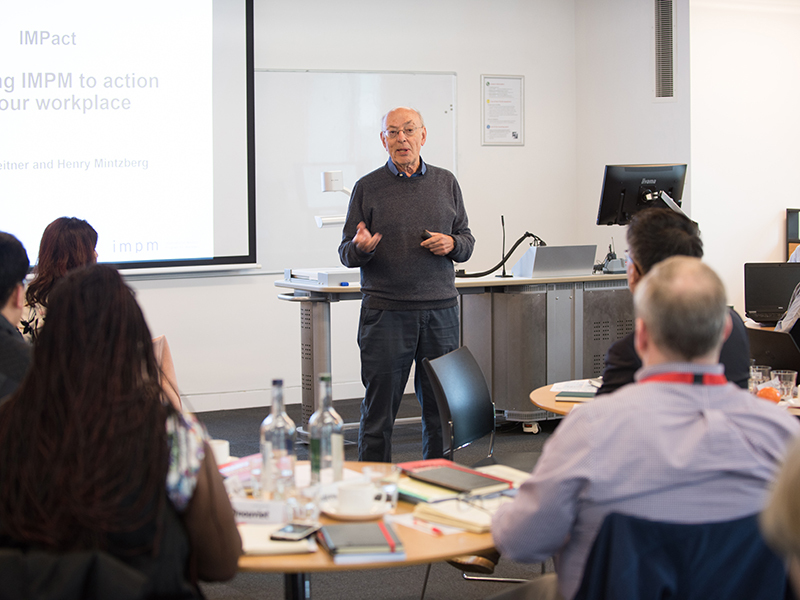 IMPM takes senior executives around the world to five 10-day modules that take place over the course of 16 months at world-leading business schools. Each IMPM module focuses on a managerial mindset: Managing Self: the Reflective Mindset at Lancaster University; Managing Organisations: the Analytic Mindset at McGill University; Managing Relationships: the Collaborative Mindset at Yokohama University; Managing Change: the Action Mindset at FGV-EBAPE Rio; and Managing Context: the Worldly Mindset at IIM Bangalore.